From 1980 to 2013 the prevalence of overweight and obesity in children has increased by nearly 50%. Many blame the consumption of sugar for this, but there is a lot of confusion as to what type of sugar we are talking about and whether natural sugar is bad or good for children. Let me clarify this confusion if you are a parent or have friends with children. A systematic review and meta-analysis published in the American Journal of Clinical Nutrition in 2013 by VS Malik and others showed that consuming sugar sweetened beverages promotes weight gain in children. Equally important as one of the causes of childhood obesity is sugar “added” to ordinary foods in a person’s diet, starting in childhood. Added sugar refers to any type of sugar or sweet syrup that is not found in the natural food. This sugar is added during manufacturing (such as in cereals, candies, soft drinks, cakes, pies, cookies) or sprinkled on when the food is eaten. It is often cane or beet sugar, corn syrup, and other sweeteners. The natural sugar found in fruit (fructose) or milk (lactose) is not considered added sugar. A study conducted by researchers at the Centers for Disease Control found that American toddlers are consuming too much added sugar. Based on results of a survey of parents of 800 children, the study’s author, Kirsten Herrick, suggested that the amount of added sugar increased along with a child’s age. For example, for the 6 to 11 month olds, 60 percent of the sugar in their diet was added sugar (not natural sugar). However, for children between 1 and 2 years old, over 90 percent of the sugar a child consumed was added. By contrast, there is no clinical study that shows that the consumption of natural sugar in concentrations available in nature is harmful to humans. Nature incorporated natural sugars in fruits and vegetables for good reasons. In addition to the energy we get from the sugar molecules, these foods have fiber and fiber- associated nutrients that the body needs for proper functioning. This means that while children may enjoy the sweet taste to eat fruits and vegetables, they are also consuming needed nutrients, as nature packaged. The problem is commercial enterprises pervert our natural food intake mechanism by adding sugar into seemingly healthy foods. For example, a regular 8-ounce serving of fruit juice may, on average, contain 5 teaspoons of sugar. A single-size serving of yogurt with fruit can contain up to six teaspoons of sugar. Even dried fruits may be loaded with sugar, up to 21 teaspoons in one cup alone. In addition, energy and protein bars and even condiments may contain added sugar. When the sugar concentration of a food item is higher than that of natural foods, you are unable to regulate your intake based on the natural control mechanisms. This is what leads to overeating, weight gain, and obesity. 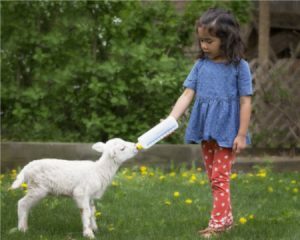 Baby animals and human babies actually exhibit an inborn capability to obtain needed nutrients as long as a variety of foods are made available to them. They are also born to know how much to eat and when to stop eating. It is the adults around babies who then influence them to develop different eating behaviors based on the culture, eating habits, and tastes that the adults have developed. About 80 years ago, an interesting experiment was conducted that supports this. Dr. Clara Davis took a group of 15 toddlers and allowed them to eat whatever they chose from a very large list of food items. She found that toddlers are capable of self-selecting foods containing the nutrients they need to grow normally. The toddlers naturally chose a variety of foods and ate only as much as they wanted at each meal setting. How is this possible? Are humans really pre-programmed to eat healthy? It appears so, and the most likely mechanism driving this is one based on our senses of taste and smell. This is known as chemical sensitivity, and it is why we delight in foods whose taste we enjoy and spit out foods who taste suggests it is bad for us. A hungry child is directed by his/her brain towards foods known to have useful nutrients by virtue of previous encounters with those foods. Chewing is a prerequisite for the effective implementation of this regulatory process, because the act of chewing releases nutrients in the mouth at a rate conducive for detection before the food is swallowed. It makes sense that almost all food items available in nature that humans depend on for nutrient intake require chewing. Perhaps you can see the problem now. In today’s mass food processing and production, coupled with aggressive marketing to children, super-charging foods with added sugar destroys our innate regulation of food intake based on natural sweetness. On top of this is also the fact that the modern diet is loaded with grains and grain-flour products. 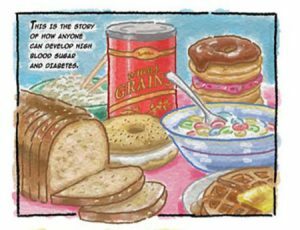 At nearly every meal, children (and adults) eat bread, bagels, flat bread, tacos, sandwiches, subs, pizza, pasta, noodles, rice, and various other grain-flour preparations, plus snacks of pretzels, chips and numerous other items made with grains and grain-flour. The problem is, grains produce the highest entry of glucose into the body, more than fruit or vegetables at equal volumes. Upon digestion in the intestine, grains yield an abundance of glucose molecules that are readily absorbed into the blood and elevate the blood sugar levels on both an immediate basis as well as over several hours following a meal. 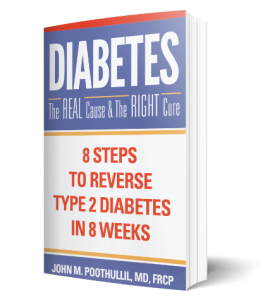 A meal high in carbohydrates from grains is also a trigger to high levels of insulin to be automatically released by the pancreas in response to elevation of blood glucose level. Although insulin helps entry of glucose into cells in the body, it also helps in the storage of glucose not immediately entering cells to become fat. 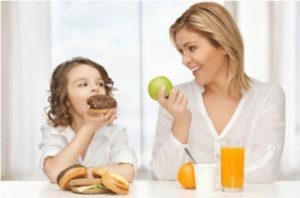 The takeaway is as follows: To prevent childhood obesity, it is critical that adults facilitate the development of proper feeding behavior in children. Be sure your child is actually hungry to initiate a meal; don’t force children to eat more than they want to eat. Be sure your children chew each bite of food, enjoying the flavors. Avoid serving grains at every meal; for at least a few meals per week, serve meat, fish, dairy, vegetables and fruit only. And above all, limit your family’s intake of foods with added sugar. This will be a serious game-changer in how you feed your children, but if you want to ensure your children do not become obese, either now or later in life as adults, it must become your rule of thumb.